A one day course designed for absolute beginners to get their first real experience with White Water Kayaking. A one day course designed for absolute beginners to get their first real experience with White Water Kayaking. 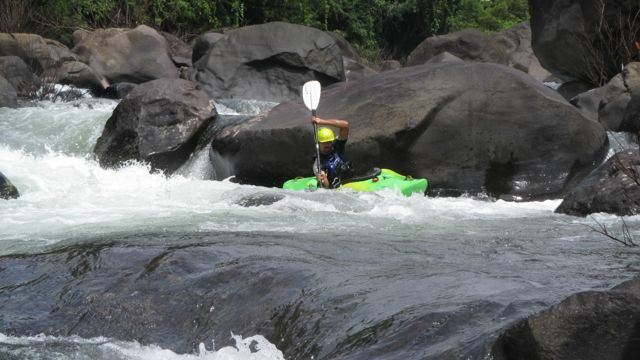 In this six hour program, participants are provided a detailed one hour theoretical session on different aspects of River Kayaking before proceeding with practical exercises in the water. Participants are not required to bring their own gear, but will be provided with a helmet, life jacket or PFD , kayak paddle, spray deck and kayak. By the end of the day you should feel much more comfortable inside that "plastic shell", inspired to continue to paddle towards new destinations, may them be rivers, ocean coasts, back waters, lakes. After completing this course you will be qualified to enroll for AFT, Roll clinics, LTR-Intro, and you can also take part to our practice sessions, with your boat or taking one from our fleet. The focus of this clinic is to learn how to roll and to improve basic skills with boat control and paddle strokes as well as to introduce the Eskimo roll. The focus of this clinic is to learn how to roll and to improve basic skills with boat control and paddle strokes as well as to introduce the Eskimo roll. The duration of this course will be 6 hours, which will be equally divided between working on the roll and your core paddling technique. Students must have successfully completed at least the LTK (Level 1), or posses equivalent paddling skills. Swimming ability is a must. The eskimo roll requires a lot of time spent underwater; therefore, it is important that prospective students are very comfortable with their heads' immersed. Must not suffer from any medical or physical condition that prohibits the participant from partaking in strenuous physical exercise. The eskimo roll is one of the most crucial moves hat a white water kayaker must master. A solid eskimo roll will accelerate your progress and help you gain confidence when running challenging white waters. We will gradually delve into the mysterious dimensions of the eskimo roll, analyzing step by step the components that make up this complex move. After working on your hip snap, you will be able to try your roll assisted by an instructor, and finally on your own. Special attention is given to the development of comfort while upside down and under the water - one of the essential factors of success in a roll. Different variations of the roll will be demonstrated to you throughout the course. It's time to practice hard and master what you have been taught during your LTK/LTR, to sharpen your weapons and prepare for when the monsoon flows. After spending time revisiting the basic strokes, we will start to execute new complex movements of the blade - to increase our precision and to gain dexterity. The next step will be combining different strokes in sequences to explore the variety of approaches that we can bring to a moving water scenario. Basic principles of slalom will be taught, and you will demonstrate the level of boat control that you have acquired while paddling through some gates (flat water). Finally, we will work on bracing techniques, refining one of the most important moves that a whitewater paddler can learn. Low brace and high brace (executed in a safe shoulder position) take a lot of time to be mastered. Let's step it up! This is a 2-day intensive course that will be held on a class II river, and on each day you will spend between 6-8 hours on the water. Students must have successfully completed the LTK (Level 1) course, or posses equivalent paddling skills. Swimming ability is a must, the possibility of swimming in white water during this course is high. To be able to "read" the waters in front of us s an essential component for a kayaker. We will start observing the water flows and their dynamics, trying to understand what happens on the surface and under it. We will learn how to identify and name all the different features that we can find in a river environment, and we will start reasoning on how those features will have an impact on our kayak descent. River reading is a learning process that will take a lifetime; in this course we will put down the foundations. Kayaking is a relatively safe sport, but while in the river many things can happen, and we need to know what to do. You will learn how to rescue yourself and how to rescue others, according to the most efficient rescue techniques hat are preferred in the river. We will teach you how to swim a rapid in the safest way, how to use a throw bag, how to take a boat to the shore, but most of all how to decide what to do in case of an emergency on the river. Running a river is an awesome experience. In order to do that we require a large amount of different skills , from the moment we start planning a trip at home, till the time we tie up the boats on the car after a great day on the river. 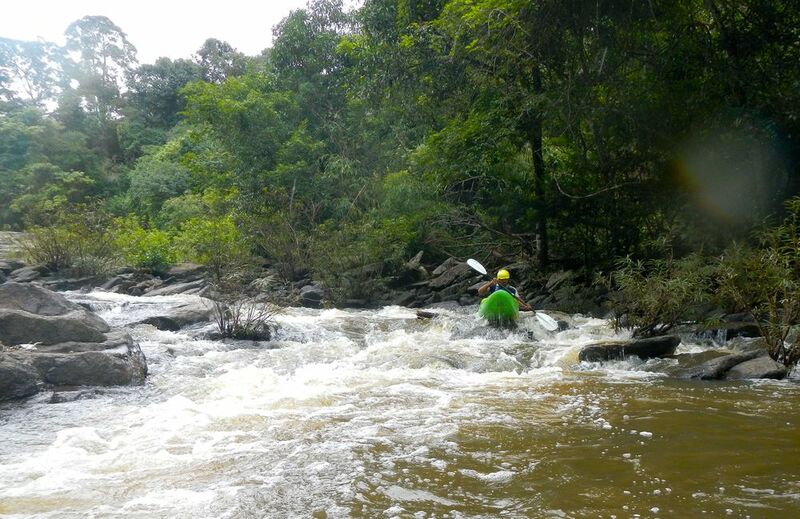 This course was meant to provide you with all those skills, building a solid preparation to kayak rivers. This is a 2-day intensive course that will be held on a class II+-III river, and on each day you will spend between 6-8 hours on the water. tudents must have successfully completed the LTR-intro (Level 2) course or achieved similar skills while kayaking. wimming ability is a must, the possibility of swimming in white water during this course is high. The more we progress in river running the more is crucial to take fast decision while choosing a line or when placing our blade into the water. To do that is essential to comprehend the flow of the water, in every aspect, and to anticipate the features of the river. This is river reading. This is what we will practice on this course, from the shore, while scouting, and form the boat, while paddling. Kayaking is a relatively safe sport, but while in the river many things can happen, and we need to know what to do. You will learn how to rescue yourself and how to rescue others, according to the most efficient rescue techniques hat are preferred in the river. We will teach you how how to decide what to do in case of an emergency on the river. You will swim rapids, learn how to use a throw bag, how to help other kayakers form the shore, and much more. How do we run the river? What should we know before putting in? How do we organize our group? What is the plan of action? How we will communicate while paddling? What do we do in case of an emergency? In this course we will spend time reasoning on how we make sure we enter the river as a group that is aware and self sufficient, proactive and ready for the challenges ahead. It's time to style our moves on the river! While catching an eddy, peeling out, or ferrying, now we need to feel confident and clear. We will try to introduce new effective strokes while doing that, aiming to gain precision while paddling down the river. In this course we will focus on how to cross obstacles like waves and holes, how to make sure we can follow our line, and how to change our line when things do not go according to our plan. Back ferries, power strokes, duffecks, braces, S-turns and more... You will be busy applying in the river all of these techniques, and much more!